Tibial plateau fracture, Fixation, Biodynamics. In the fracture involving the articular surface, the Tibial Plateau Fracture (TPF) is one of the more common types . For patients with complex TPF involving the posteromedial column, their joint structures are severely damaged. The treatment efficacy of gypsum fixation, traction and other traditional methods are not very obvious [2,3]. Therefore, new approaches are needed for treatment of this disease. 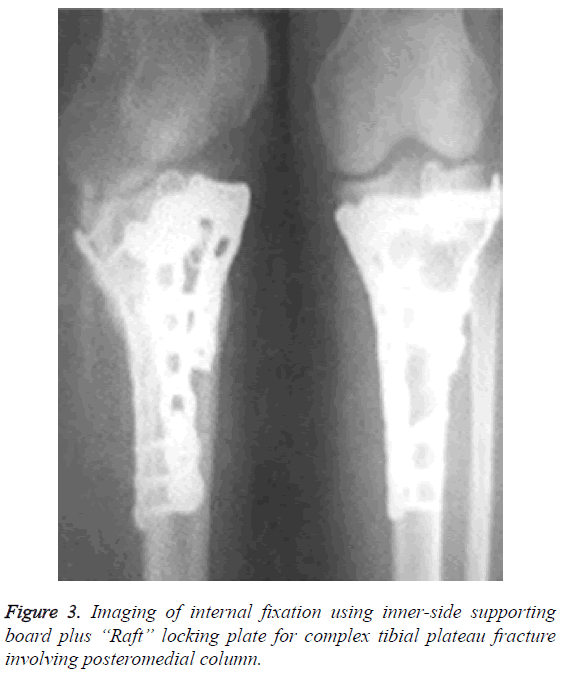 Surgical internal fixation is the most common method in the treatment of complex TPF [4,5]. In this study, a complex TPF model was developed to compare the effects of internal fixation using inner-side supporting board plus “Raft” locking plate and fixation using lateral "T" shaped plate. The objective was to provide a reference for further application of internal fixation using inner-side supporting board plus “Raft” locking plate to treating complex TPF involving posteromedial column. Twenty-eight corpses were selected (all male adults). The upper and lower ends of the tibia were taken as the bone specimens. A total of 28 models of TPF involving the posteromedial column were made according to Kelly's method. All models were randomly divided into A and B groups, 14 models in each group. The inclusion criteria were as follows: i) the corpses of bone specimens were fresh; ii) the selected bone segments were intact and undamaged, and could be used for model making. The collected bony specimens were numbered. The soft tissues outside the bone were removed using knives, scissors and other tools. The bony femoral tibial joints were retained. In group A, the internal fixation using inner-side supporting board plus “Raft” locking plate was performed in accordance with the TPF model of the Kelly model. In group B, the fixation using lateral "T" shaped plate was performed. According to the different structure and state of the model, the appropriate "T"-shaped locking plate was used for fixation. In order to increase the accuracy, the bone specimen selection and the model making process in two groups were completed by the same doctor. Sensor was fixed at three points of the model. The sensor was connected to a digital display type resistance strain gauge (YJ-14) using a data line. The electronic universal testing machine (HT-9102) was used to detect the load displacement of the two sets of models. In the first, the test machine was fixed on the femoral condyle, and the test parameters were adjusted. The load range in this study was 0-1000 N. When the load was increased, the speed was 1.4 mm/min. High precision grating displacement transducer (KG-100 type) was used to measure the horizontal and vertical displacement of the inner and outer ends of the tibial plateau. The accuracy of the testing machine was adjusted to 0.001 mm and the torque change, horizontal shear stiffness and axial stiffness and load of displacement were detected. All statistical analysis was carried out using SPSS17.0 software (SPSS Inc., Chicago, IL, USA). The data were presented as mean ± SD, and were compared using t test. P<0.05 was considered as statistically significant. Biomechanical model of TPF fixation was shown in Figure 1. The three points (A-C) were the sensor fixed position. KG was a digital high-precision grating displacement sensor. The schematic views of the posterior medial plate fixation were shown in Figures 2 and 3. In clinical treatment, the choice of the placement of the plate should be based on the direction of the fracture line. 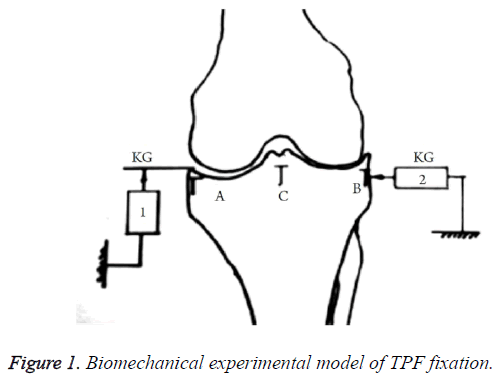 Figure 1: Biomechanical experimental model of TPF fixation. 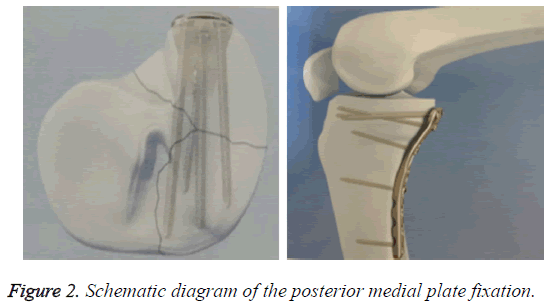 Figure 2: Schematic diagram of the posterior medial plate fixation. Figure 3: Imaging of internal fixation using inner-side supporting board plus “Raft” locking plate for complex tibial plateau fracture involving posteromedial column. Imaging of fixation in group A was shown in Figure 3. The general fixation operation was as follows: the patients received the general anesthesia. The intravenous infusion of antibiotics was performed at 30 min before surgery. The anterolateral incision and the medial inverted "L" or straight incision were selected. After determining the joint surface as good by X-ray, the external joint was fixed using the “Raft” locking plate fixation, and the medial side was fixed using 3.5 mm supporting board. The imaging of fixation in group B was shown in Figure 4. The euthyphoria reduction was performed on the posterolateral tibial plateau fracture. After confirming that the fracture block and articular surface collapse obtained satisfactory reduction, the lower platform grafting was conducted, followed by fixation using lateral 3.5 mm "T" shaped plate. 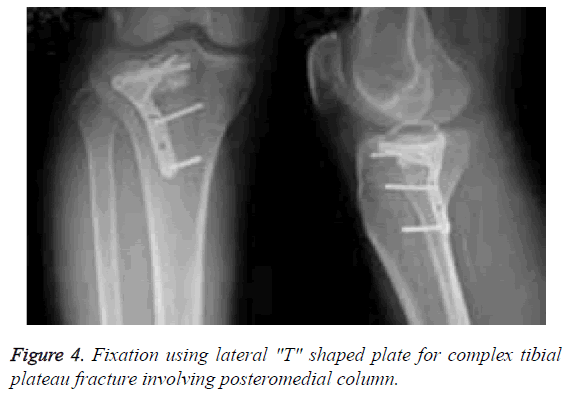 Figure 4: Fixation using lateral "T" shaped plate for complex tibial plateau fracture involving posteromedial column. As shown in Table 1, the average load of displacement in group A was 0.07 ± 0.01 mm, which was significantly lower than 0.12 ± 0.03 mm in group B (P<0.05). The average axial stiffness in group A was 3157 ± 346 N/mm, which was significantly higher than 2683 ± 253 N/mm in group B (P<0.05). The average stiffness of horizontal shear in group A was 2165 ± 217 N•m•Deg-1, which was significantly higher than 1593 ± 142 N•m•Deg-1 in B (P<0.05). The average torque changes in group A was 1.93 ± 0.21 N•m, which was significantly higher than 1.52 ± 0.14 N•m in group B (P<0.05). Table 1: Comparison of biomechanical indexes between two groups. TPF is a complex intra-articular fracture. Previous research shows that, the incidence of TPF in elderly fracture is up to 10% . The complex TPF involving the posteromedial column still has no perfect treatment in clinical practice. There are still serious challenges for effective treatment of this fracture . In this study, we compared the biomechanical characteristics of internal fixation using inner-side supporting board plus “Raft” locking plate and fixation using lateral "T" shaped plate for complex TPF involving posteromedial column. This can enrich the clinical study on TPF therapy, and provide a reference for further clinical application of internal fixation using inner-side supporting board plus “Raft” locking plate to treating complex TPF involving posteromedial column. Results of this study showed that, the average load displacement in group A was significantly lower than that in group B (P<0.05). In addition, the average axial stiffness, average horizontal shear stiffness and average torque change in group A were significantly higher than those in group B (P<0.05). The reasons may be as follows. First of all, in the surgical approach to the fracture site for reduction and fixation, the good exposure and vision are particularly important for ensuring the treatment efficacy of complex TPF [8-10]. The internal fixation using inner-side supporting board plus “Raft” locking plate can perform the medial and lateral fixation of the fracture site, so the fracture site is easily revealed, which can create a better vision for the treatment of complex TPF . Secondly, the relevant study points out that, the surgery can provide a strong support for fracture site, which has great significance for the recovery of fracture. If the fracture site is not well supported, the secondary separation and collapse are likely to occur . In the present study, the internal fixation using inner-side supporting board plus “Raft” locking plate was used in group A. On the one hand, the "Raft" plate is fixed to the outside and a sufficient pressure is generated between the bone blocks by a locking nail driven from the outside to the inside . On the other hand, the inner-side supporting board can greatly alleviate the shearing force of the separated bone pieces when the fracture site is in the flexion position . This can provide a more stable biomechanical environment, which significantly eases the fracture site of the load-displacement . At the same time, the strong support also helps to enhance the axial stiffness of the fracture site and the horizontal shear stiffness, thus avoiding the re-separation of the tibial plateau . This can provide a direct and effective support for the separation of the posterior medial column of the fracture, and make the medial posterior tibial plateau biomechanical line to achieve better recovery . In group B, only the fixation using lateral "T" shaped plate was performed. The pulling to the separated bone blocks is not enough to withstand the post-operative postslip trend of femoral condyle at fracture site when the patients perform the movement . At the same time, it cannot provide sufficient bone support for reconstruction of postoperative ligaments . This has provided a theoretical basis and support for the application of internal fixation using inner-side supporting board plus “Raft” locking plate to treating complex TPF involving posteromedial column. In conclusion, compared with fixation using lateral "T" shaped plate, the internal fixation using inner-side supporting board plus “Raft” locking plate can obtain better biomechanical stability for treatment of complex TPF involving posteromedial column. This study still has some limitations. The sample size of this study is relatively small. Larger sample size will make the results more convincing. In our next studies, the sample size should be further increased for obtaining more satisfactory findings. Waddell JP, Johnston DW, Neidre A. Fractures of the tibial plateau: a review of ninety-five patients and comparison of treatment methods. J Trauma 1981; 21: 376-381. Luo JM. Treatment of posterior condylar tibial plateau coronary splitting fracture. Chin J Orthopa Trauma 2009; 22: 45-46. Moore TM, Patzakis MJ, Harvey JP. Tibial plateau fractures: definition, demographics, treatment rationale, and long-term results of closed traction management or operative reduction. J Orthop Trauma 1987; 1: 97-119. Kiefer H, Zivaljevic N, Imbriglia JE. Arthroscopic reduction and internal fixation (ARIF) of lateral tibial plateau fractures . Knee Surg Sports Traumatol Arthrosc 2001; 9: 167-172. Mahadeva D, Costa ML, Gaffey A. Open reduction and internal fixation versus hybrid fixation for bicondylar/severe tibial plateau fractures: a systematic review of the literature. Arch Orthop Trauma Surg 2008; 128: 1169-1175. Elsoe R, Larsen P, Nielsen NP, Swenne J, Rasmussen S, Ostgaard SE. Population-based epidemiology of tibial plateau fractures. Orthopedics 2015; 38: 780-786. Higgins TF, Kemper D, Klatt J. Incidence and morphology of the posteromedial fragment in bicondylar tibial plateau fractures. J Orthop Trauma 2009; 23: 45-51. Chang SM. Selection of surgical approaches to the posterolateral tibial plateau fracture by its combination patterns. J Orthop Trauma 2011; 25: 32-33. Garner MR, Warner SJ, Lorich DG. Surgical approaches to posterolateral tibial plateau fractures. J Knee Surg 2016; 29: 12-20. Higgins TF, Klatt J, Bachus KN. Biomechanical analysis of bicondylar tibial plateau fixation: how does lateral locking plate fixation compare to dual plate fixation? J Orthop Trauma 2007; 21: 301-306. Chakraverty JK, Weaver MJ, Smith RM, Vrahas MS. Surgical management of tibial tubercle fractures in association with tibial plateau fractures fixed by direct wiring to a locking plate. J Orthop Trauma 2009; 23: 221-225. Tahririan MA, Mousavitadi SH, Derakhshan M. Comparison of functional outcomes of tibial plateau fractures treated with nonlocking and locking plate fixations: a nonrandomized clinical trial. ISRN Orthop 2014; 2014: 324573. Biggi F, Di Fabio S, DAntimo C, Trevisani S. Tibial plateau fractures: internal fixation with locking plates and the MIPO technique. Injury 2010; 41: 1178-1182. Jenkins TM, Sala-Newby G, Campbell AK. Measurement of protein phosphorylation by covalent modification of firefly luciferase. Biochem Soc Trans 1990; 18: 463-464. Sassoon AA, Torchia ME, Cross WW, Cass JR, Sems SA. Fibular shaft allograft support of posterior joint depression in tibial plateau fractures . J Orthop Trauma 2014; 28: 169-175. Gao L. Postoperative nursing of the tibial plateau fractures with T-plate internal fixation. Chin J Orthopa Trauma 2009; 22: 912-913. Tian K, Duanmu QL, Ni LZ, Huang DH, Mei ZF, Qu HB, Lei WT, Zhu H, Han YT, Ma W, Zhao QH. Surgical treatment of tibia plateau fractures with external fixator and the locking plate. Chin J Orthopa Trauma 2009; 22: 618-620.